Have a question for Holiday Beach Wellness Hotel with Sauna Park? Hungary's one and only boat-shaped hotel welcomes you right at the Danube riverbank in green surroundings and offers you great pools and free Wi-Fi access. The center is easily reachable by public transport, and the nearest bus stop is a 3-minute walk away. You can enjoy the view of the Danube and the opposite river bank covered with forests right from your hotel room at the Holiday Beach Wellness Hotel with Sauna Park. The hotel features 2 restaurants, a grill terrace, a pool bar, and serves a hot buffet breakfast each morning. An outdoor swimming pool, a fun bath, a children's pool, 2 hot tubs for 8 people, and a soccer court are also at the guests' disposal. Keep fit in the fully equipped cardio, fitness, and aerobic room, relax in the sauna area which includes Finnish, bio, and infrared saunas, a steam room, and an aromatherapy salt room. You can also treat yourself to a visit in the beauty parlor. A wide range of conference facilities cater for the needs of business guests. Holiday Beach Wellness Hotel with Sauna Park has its own landing stage. Boat trips on the Danube to various destinations can be organized by the hotel. The EuroVelo 6 Bicycle Road runs right on the riverside. 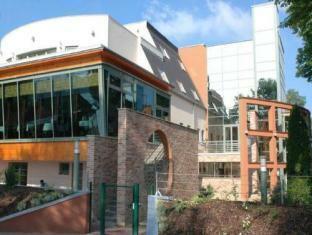 position - on the Donau side, nice employees, correct prices in the outside terasse +1 Fitness/ beauty salon!!! 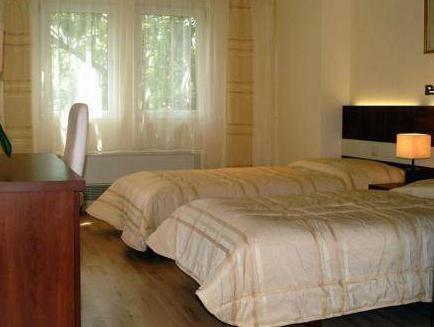 The room itself was clean enough place, nicely furnished. But bathroom was a catastrophe: burning smoking hairdryer, quit dirty - mushroom shower & we overheard from reception complain for bugs/ ants. 2 Swimmingpools which are nice & big but nothing for low age kids. More for couples or young groups. nice walking on the Donau side. Great small restaurants / bars within walking distance. Relaxed place, lift. Nice buffet breafast. Must have a car if you like to reach city center otherwise to far away & not really frequent public transport & changes between bus / tram/ metro. Friendly neighbourghood, but not much attraction close by. main building much nicer then the side one, if chance get a room in Main ship formed building. Not super easy to find without GPS, parking is possible outside on the street without paying but not checked by camera. globally nice place to stay. Little too expensive. Perfect. Swimming at the hotel pool during hot days combined with visiting city center with close bus. We stayed for 2 nights purely for the air-con and pool. The hotel is out of town but great if you have kids and a car for transport. The pool is excellent, with plenty of lawn and chairs/umbrellas. The room was comfortable and clean, very modern. Great bathroom. Wifi worked well, air-con was great in the Budapest heat. We didn't think the meals were so great in the cafe/terrace area, overpriced for what it was. Drinks were very expensive by Budapest standards. Breakfast was delicious and varied, however. We would stay here again just for the pool! We both got massages which were pretty good, though my partner asked for the sports massage to help with his shoulder soreness and he said it was not really a sports massage, more just a relaxation massage. 1 éjszakát töltöttem a hotelban, de ár/érték arányban nagyot csalódtam. A személyzet nagy része rendkívül rugalmatlan. 2-től lehet elfoglalni a szobákat, fél 1-kor szerettem volna átvenni, amiért 20 Euro többlet költséget akartak felszámolni egy 25 ezer forintos szoba esetében. Nem kaptunk francia ágyas szobát, hiába kértünk, a széfben lemerült az elem, amikor beraktam az értékeimet. A wellness részlegen a szaunák fele nem üzemelt, hiába van 9-ig nyitva a részleg, a bár már 7 előtt bezárt. A vacsoránknál a rendelésünket elrontották, persze a szervíz díjat felszámították kétszer is. A parkolásért természetesen pluszban 3000 Ft-ot kellett volna még fizetni, ezért inkább az utcán álltunk meg. A hotel szobái nagyon olcsó anyagokkal van felszerelve, a szellőző rendszerből végig a konyha szaga áradt, egész éjszaka sültkrumpli szag terjengett a szobánkban és a hotel több ponton is beázott. Számtalan kis negatív élmény ért kicsit több mint 12 óra leforgása alatt. A végén természetesen a fizetésnél nem kérték ki a véleményünket, hogy jól éreztük-e magunkat, elégedettek voltunk stb. Nem ajánlom ezt a hotelt. Ha ki kell emelnem valamit, akkor két pozitívumot tudok, az egyik a takarítőnő kedvessége, aki többször is a segítségünkre sietett, a másik pedig a hotel fekvése.